Yukon’s delegates continue to lead and inspire at the National Convention. Again and again, members of our group have stood in front of hundreds of union activists and presented cohesive, well thought out and persuasive arguments for and against resolutions under debate. Yukon delegates have also contributed greatly to the work of each Convention Committee, seated at the head table to face the membership and their questions. Teresa Acheson spoke in favour of a resolution to fully fund Regional Conventions, reminding delegates that the proposed budget reflects lower dues for all members, even with this resolution. She reminded them also that every delegate at #PSAC2018 attends thanks to funding from various sources. After coming to the floor again and again, convention after convention, 2018 delegates strongly supported the resolution to fully fund Regional Conventions. Teresa’s decisive arguments came just ahead of the vote, and we believe she helped solidify the win. 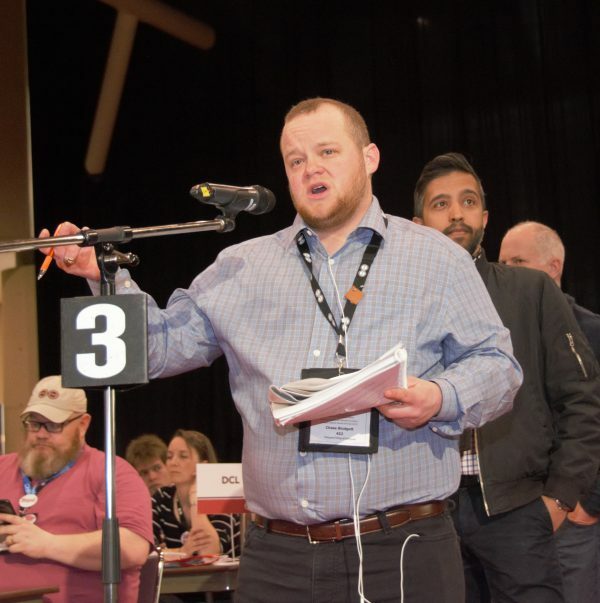 YEU’s Stephanie Coulthard stood in support of a resolution to help democratize the election of PSAC Regional Executive Vice President, North. Previously, the position required a candidate to move to Yellowknife if elected. This non-negotiable barrier discouraged many qualified, committed activists from considering a campaign. The floor voted in favour of the resolution to allow REVP’s to live and work in any city with a PSAC Regional Office. For northerners, that means REVP candidates may choose to live in either Whitehorse, Yellowknife, or Iqaluit. Elections were held first thing Thursday morning for the roles of PSAC National Executive Vice President and National President. Two candidates vied for the top job – Chris Aylward, sitting NEVP and Fabienne Jean-Francois, National Vice President of CEIU. Sister Jean-Francois secured 23% of the vote, while Brother Aylward achieved the majority and won the seat. Sister Magali Picard, REVP for Quebec was acclaimed as NEVP, with Sharon Desousa accepting the Alternate NEVP position. A long line of buses waited outside the Toronto Convention Centre to drive delegates to the start of a Fix Finance & Fix Phoenix rally at noon. Despite the rain, a large and raucous crowd marched and chanted, arriving at the constituency office of Finance Minister Bill Morneau. He has a lot to answer for to the workers of this country, including Bill C-27 which will jeopardize the pensions of Canadian workers. Our Yukon activists didn’t let the rains low them down, marching in full solidarity with our affected brothers and sisters. Phoenix needs to go, and Canada’s public servants MUST be paid, correctly and on time, for their work. The Universal Declaration of Human Rights, Article 23.3 states “Everyone who works has the right to just and favourable remuneration ensuring for himself and his family an existence worthy of human dignity, and supplemented, if necessary, by other means of social protection.” The PSAC demands that the Liberal Government fix Phoenix now. After hours of debate with over 80 speakers lined up at the microphones around the hall, a controversial resolution put forward by the Collective Bargaining Committee to allow electronic voting in some cases was passed. Following the vote, delegates again lined up at the microphones to record against, ensuring the minutes show their opposition to this contentious change. For those of us in the far north, we believe this change may allow greater participation in ratification votes for members in remote communities. A moving tribute to 30 year PSAC activist and two term President Robyn Benson wrapped up the business of the day, with delegates looking forward to an old fashioned Manitoba Social in her honour. Tomorrow will provide an opportunity to get back to debate and voting for the morning before Frank Miller, elder from the Mohawk Turtle Clan offers a traditional blessing to close the 2018 Convention. The third day of PSAC’s Triennial Convention was a day of debate, discussion, points of order and privilege. Much of the day was spent discussing constitutional resolutions, sometimes fairly dry business, but critical in ensuring the foundation of the union is sound and reflects the values of the membership. Some important decisions were made, including the adoption of the term Indigenous to replace Aboriginal, throughout the PSAC and its committees. There was a lot of debate over a resolution to add 35 Equity delegate seats to the regional seat entitlements to national conventions, and our delegate Chase Blodgett spoke passionately in favour of this resolution. In fact, his powerful comments elicited thunderous applause, and a standing ovation. Sadly, despite that support the resolution was not passed. As Yukon Area Council representative Linda Moen says, equity delegates and area councils will go home knowing where to focus their work. YEU delegate Derek Yap has been working as a member of the Constitutional Committee for the last several months, and Day 3 was a long one for he and his colleagues. They spent many hours in meetings, as many resolutions were referred back to the committee with instructions from the floor to make changes. NEU President Bill Fennel and Derek Yap cast their electronic ballots on the main stage of the PSAC Triennial Convention, members of the General Resolutions Committee. Derek Yap, YEU delegate and Local Y022 member. Monday April 30 was a very important day at the 18th Triennial Convention of the PSAC. Revered Senator Murray Sinclair, past chair of the Truth and Reconciliation Commission was keynote speaker. He spoke of painful issues with great dignity and gentle humour, sharing his insights into the reality of life for many indigenous people. Generations of residential schools, racists policies and systemic discrimination worked to eradicate indigenous culture and any sense of cultural identity or pride. The damage done by over 100 years of this genocide impacts all of us even now, and was spoken to very powerfully by indigenous delegates who bravely shared their stories. A multi-media performance entitled No More Stolen Sisters employed video, music and dance to honour the Murdered and Missing Indigenous wives, daughters, mothers and sisters lost forever. Our eleven delegates to the 2018 PSAC National were in their seats and ready to work when the week long conference began Sunday. The day kicked off with a meeting of delegates from across the North, including Nunavut and the NWT. YEU Vice President Paul Johnston joined UNW President Todd Parsons and NEU President Bill Fennel on a panel to explain the resolutions, constitutional work and financial proposals their respective committees had worked on. Presidential candidates vowed to visit remote northern communities and talk to members about what they need from the PSAC. None claimed to be experts on the north, but all expressed their intent to stay open to the needs of the region, and to try and learn from the members – the real experts. 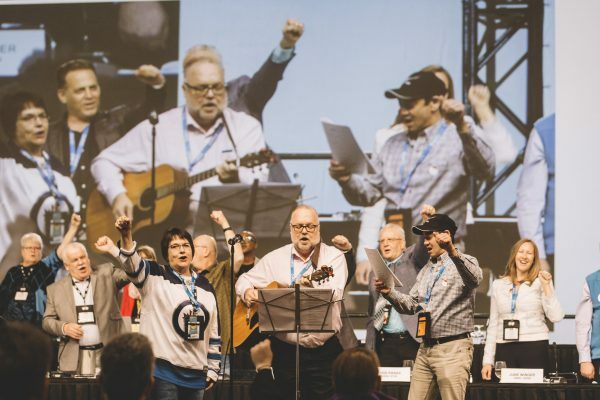 YEU delegate Derek Yap was honoured to be asked to join two other activists in singing Oh Canada and Solidarity Forever to open the Convention. He did a great job, and we were all very proud! Day two is the start of the real work, the business of Convention with debates on resolutions, finance, constitution and more on the agenda for the coming days. We will let you know things are going, and share stories of our delegates in action. We are only a few days away from the National Convention of the Public Service Alliance of Canada. As usual, the Yukon Employees’ Union will send a delegation of activists to Convention to represent us at the national level. Our delegates hail from six Locals, and reflect the diversity of our union. Members of our Executive have played key roles on several Convention committees, meeting over the past several months to discuss resolutions, finances and more. Their contributions will continue once we reach the Convention floor in Toronto. Senator Murray Sinclair, Chief Commissioner of the Truth and Reconciliation Commission will be the Keynote Speaker on Monday April 30th, a speech certain to be moving and memorable. In fact, the week’s agenda is packed with resolutions, plenary and committee sessions, regional caucuses, after hours educational opportunities and speakers. YEU will provide daily Convention updates which we hope you’ll follow. Look for Live Facebook video feeds and regular posts from the floor. Make sure to like the YEU’s Facebook page, keep up to date at the PSAC’s Facebook page and follow the twitter feeds of both the Yukon Employees’ Union and the Public Service Alliance of Canada. If you want to keep it simple, just follow #PSAC2018 on Twitter and you’ll see it all. PSAC National President Robyn Benson is retiring, and a number of activists have announced their candidature. The field of candidates is diverse and exciting, with a representative cross section of Canadians offering their skills and experience to lead this dynamic organization through the coming years. Stay tuned – follow the hashtags and watch for our regular updates. We want to be sure our members see the big picture – your representatives working for you at the PSAC 2018 National Convention. 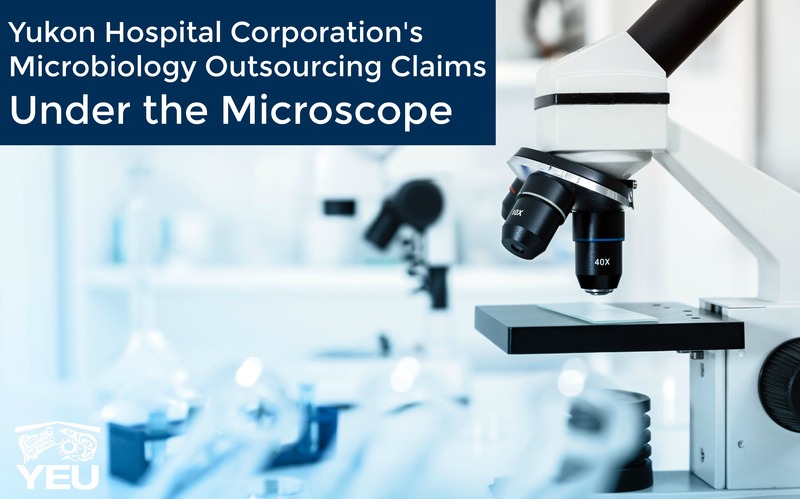 The Yukon Hospital Corporation responded swiftly to the Union’s recent statements exposing the corporation’s plan to outsource microbiology testing to St. Paul’s Hospital. They were quick to appease the public and the press, saying there was nothing to the story. They insisted our information was false. They said the contract had always existed, and therefore nothing important would change. And anyway, even if it did change, it wouldn’t matter much. They suggested it might be an improvement in service – since we don’t have the same technology here – plus it’s cheaper and easier to send the work south. And hey, it’s only about 1,500 tests a year anyway. We want to make sure you know the truth. In a public statement, the Hospital Corp said “This proposal is currently being reviewed and a final decision will be based on our ability to provide the best care possible to Yukon patients in terms of quality and timeliness.” The Hospital has not ruled out sending important routine microbiology tests to St. Paul’s hospital. It is still possible that they have already signed, or will soon sign an agreement cementing a plan to ship Yukon patients’ specimens to Vancouver for testing. We believe that if the Hospital Corporation begins shipping all routine microbiology tests to BC, the impact on the health of Yukoners could be profound. Even setting aside the obvious privacy and confidentiality concerns, the risks of live sample transport to BC from the Yukon can’t be dismissed. Many blood samples, urine tests and cultures (throat, wound, etc.) are only viable for a finite period of time – hours, in some cases. Quality of care for citizens in many parts of the territory is already compromised by distance. Residents of Old Crow routinely face delays because of their remote location; adding transit time to include the trip to Vancouver is only going to make matters worse. The Hospital Corporation has promoted keeping healthcare in the Yukon close to home; increasing capacity, modernizing and reducing the volume of exported care. Citizens of Yukon have contributed hundreds of thousands, even millions of dollars through fundraising efforts and have helped secure the purchase of mammography equipment, CT scanning and MRI systems. Choosing to export this routine work out of territory is like stepping back in time. The equipment needed to make sure the microbiology lab at WGH can keep pace would be far less costly than an MRI or CT scanner. The hospital’s spokesperson was quoted, saying this move would only affect about 1500 tests per year. NOT true. In fact, YEU and the Hospital Corp recently collaborated on a workload document as part of the bargaining process. Statistics provided to YEU by WGH show an increase of 7% year over year, or a cumulative increase of 30% in the volume of testing routinely performed by the microbiology lab between 2013 and 2015, when the lab conducted in excess of 17,000 tests per year. In the hospital’s own RFP, they cite almost 20,000 microbiology tests per year in the proposed scope of work. Through ATIPP, YEU has acquired a copy of the Hospital Corporation’s recent Request for Proposal for a Professional Services Agreement to provide Laboratory Medical Directorship, Laboratory Consulting and Biological Sample Testing Services (RFP #DTS-2017-08-28) issued August 28 2017 and closing October 31, 2017. According to the hospital’s own data, the quoted 1500 tests per year is less than the work of one month. Yukoners deserve healthcare that is reliable, timely, and performed close to home. Exporting tests as common as a throat swab for Strep, a urine or STI test makes no sense. It’s taking us backward, rather than moving us forward. The Yukon Employees’ Union is raising this issue with the public because it’s important. The hospital assures us that no members will lose their jobs, but will be shuffled into other positions. We are not raising this flag because we are concerned about the loss of union jobs, but because we are worried about protecting the services we all rely on. Downgrading our ability to diagnose and treat illness quickly and locally is a bad idea. Adding time between testing, diagnosis and treatment will not enhance our health and we believe it’s a terrible plan. These discussions and negotiations should be transparent, and those appointed to protect the health of Yukoners must stay focused on more than the cost. We’re asking the Yukon Hospital Corp for answers on behalf of all Yukoners. Will you commit to properly staff the Microbiology lab at WGH so all routine and emergency microbiology testing can continue to be performed in the Yukon? Do you commit to investing in the equipment and training necessary to keep our lab up to date and capable of performing the diagnostic tests our growing population demands? Can you state for the record whether you intend to proceed with a contract to outsource routine microbiology testing, as identified in the 2017 RFP, thus diminishing the capacity of our hospitals to provide close to home care for Yukoners? Yukon Employees Union is seeking a visionary, dynamic, and driven leader to serve as our next Executive Director. The Executive Director is the sole managing director of the Yukon Employees’ Union and is responsible for the day-to-day oversight of all aspects of the operation. 4. All aspects of Human Resource Management for YEU staff. A competitive candidate will have extensive knowledge and experience in the areas of management, finance, administrative law, labour relations and conflict resolution. The level of knowledge and skill required is typically achieved through post-secondary education in business, law, labour relations, or human resources, and ten or more years’ experience in a similar leadership position. The Executive Director should have experience with collective bargaining/grievance processes and should have in-depth knowledge of the benefits and challenges associated with unionized working environments. YEU’s Executive Director must be ethical, strategic, resilient and collaborative in order to meet the needs of nearly 5,000 members and the staff. This challenging position is rewarded with a competitive salary, excellent pension, medical and dental plans, training opportunities and other benefits.